The New SwiMP3 underwater MP3 player is an incredible audio experience. Imagine listening to hours of your own music during your swim workout. The SwiMP3?s innovative sound transfer technology offers exception underwater sound quality. 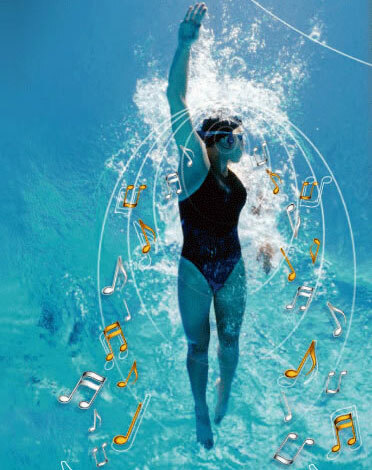 Standard players rely on the transmission of sound through air or water causing the swimmer to perceive only muffled noise. The SwiMP3 uses bone conduction ? the direct transfer of sound vibrations from the cheek bone to the inner ear ? to provide the swimmer with exceptional sound clarity. The SwiMP3 is fully waterproof and can be used with all the competitive swim strokes. 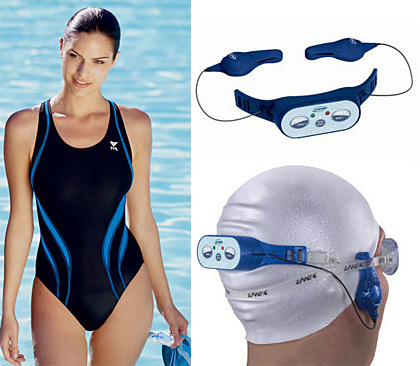 Includes a USB cable to connect the player to your computer and charge the batteries, 128 MB of RAM for music storage, Music Match software (not required to download music on the player), one pair of Lane 4 OxyGen 2 Goggles (although the player will work with other goggles), 90 day warranty. I have three thoughts on the subject: by having something strapped to your head would that affect your performance, hydrodynamically or through distraction? I guess we wouldn't see these in the Commonwealth Games any time soon. Would you be able to listen to podcasts and audio magazines, such as… oh I don't know, say… the Rubenerd Show? And even for a self confessed nerd who doesn't like to swim, even this seems too much ;).